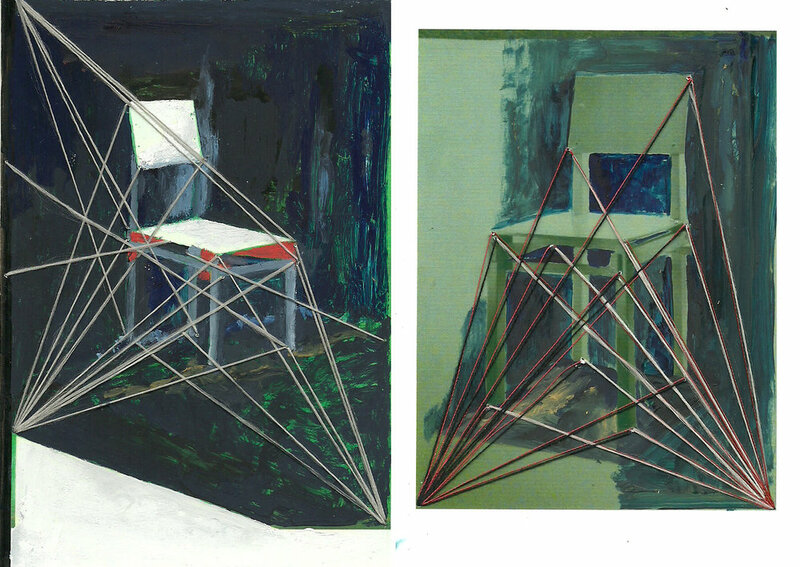 Davis’ paintings cite and improvise on a high modern repertoire of architectural and design forms, adding stitched geometries and broad washes of translucent pigment to conjure a set of complex interior spaces that convey something of the existential doubt that began to infect the modernist project during the post-war period. In the drawers of an elegant desk in the upstairs room, Davis has placed a series of altered photographic reproductions from Lesley Jackson’s Modern British Furniture. Stitched and painted across, these canonical tubular steel and leather chairs are pulled back from their pristine functionalism to a provisional status that simultaneously offers and questions the promise of a plan for living. The use of needlecraft in both the paintings and photographs reinfuses the angular severity of industrialised production methods with a comforting domesticity, reminding the viewer of the quite different principles that had informed pre-modern design movements. Entry Point, a steel and thread sculpture suspended in the stairwell, effortlessly achieves a harmony of materials, form and space that evokes approval of the modernist integration of art and life.